Did morning fast walk on the treadmill while watching tvb drama, had yummy peanut butter n strawberries sandwich, took a refreshing shower, wore my cute rabbit T to work. When I got there at my desk, I saw a tiny envelope with my name on it. 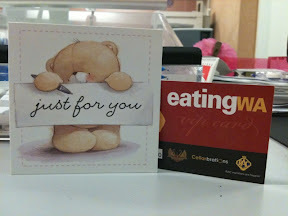 Curious, opened it up and saw the forever friends bear tiny card with a eatingwa VIP card!!! My mood was flying high, thinking what's the special occasion! Opened up the card, saw a huge thank you written on the left side of the card. I thought I'm having some bad luck recently... But I guess it's gone now!!! Haha thanks Brooke for the thoughtful gift! Love it! What isit so good about the eatingwa VIP card?? Discounts at Western Australia's top rating restaurants! FREE bottle of wine from Cellarbrations or Liquor Barons! Multiple uses at your favourite restaurant! If you love eating out like I do, you should get this VIP card. It's worth it. You can get 25% off the bill from selected restaurants. There are around 53 restaurants for you to choose from. Use the card 5 times at top rating restaurants and receive your free bottle of wine from Celarbrations or Liqour Barons! Go to eatingwa now and sign up as a member. What's even better? You will get more discount if you are RAC member when you purchase the VIP card! !